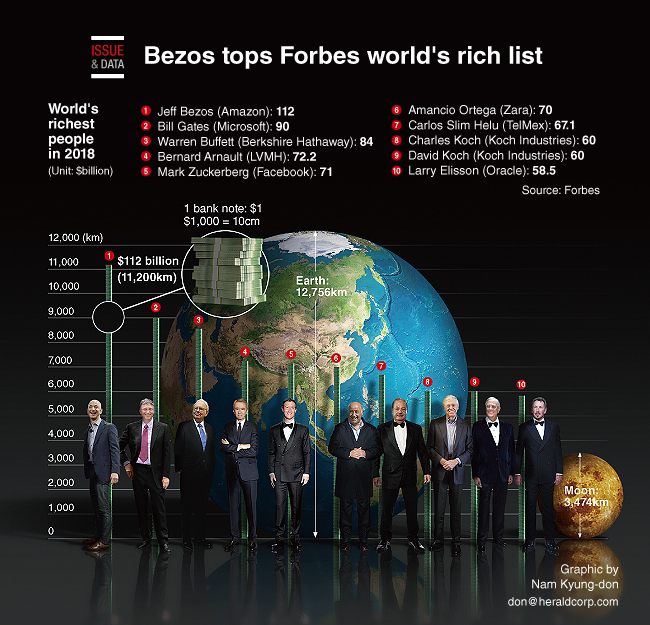 Amazon chief Jeff Bezos is now the world's richest person, having snatched the top spot from Microsoft founder Bill Gates, who slipped to second place, according to Forbes magazine's annual billionaires list. US President Donald Trump's ranking on the list fell to 766th place from 544th in the last edition, his wealth now being estimated at $3.1 billion, $400 million less than a year ago. Bezos' fortune shot up to $112 billion, Forbes said, after a 59 percent rise in Amazon shares over the past 12 months that put him way ahead of the $90 billion listed for Gates. Legendary investor Warren Buffett held on to his No. 3 ranking, followed by French industrialist Bernard Arnault. Samsung Group's Lee Kun-hee was No. 61 on the list, according to the magazine.